In the Florentine artistic panorama between the late 16th and the early 17th century we can take for granted the existence of a movement which – partially opposing the Giambologna tradition – was oriented towards neo-Renaissance forms of purism, for many aspects similar to those developed in the painting field through the teaching of Santi di Tito and Jacopo da Empoli. 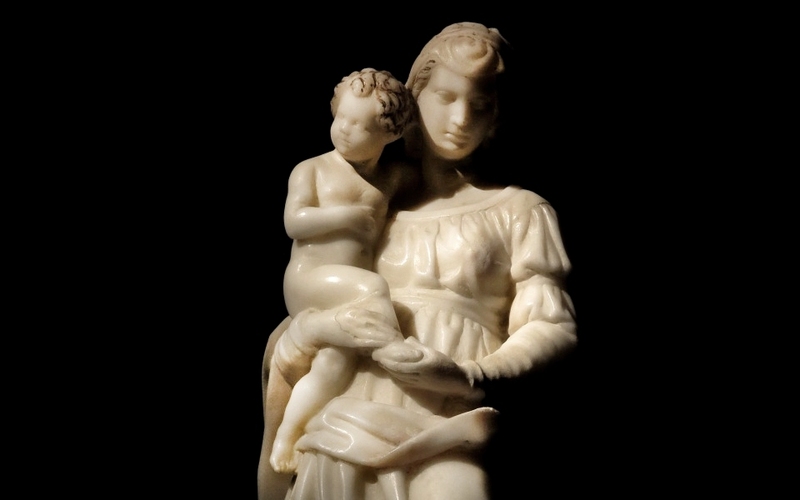 This small alabastrine marble Virgin with Child fully represent this cultural moment. Her character is defined by many and explicit early-sixteenth century elements: from the shape of the dress, with the double clip on the sleeve, to the slow and almost monumental cadence of the pose. The Child is clearly inspired by Andrea del Sarto’s Madonna delle Arpie with the same legs scheme and also clearly influenced by the Angels and Cherubs derived from the Giambologna models especially for the shape of his head; a direct comparison can be also made with two Candleholder Angels in the Madonna dell’Umiltà Church in Pistoia, attributed to Pietro Tacca. The segmented profile of the long coat falling down along the Madonna right elbow – and the deep cavity, cutted by short folds of the drapery, diagonally separating the legs – seem to be inspired by the style of Giovanni Caccini; in fact to this artist – and particularly to his Madonna in Santa Maria degli Angeli in Florence, and to the one at the Victoria and Albert Museum – can be referred the nearly ‘greasy’ sweetness of the Virgin face, highlighted here by the translucent, almost evanescent, alabastrine marble. The attribution of this Virgin with Child to Orazio Mochi comes as a result of this stylistical and chronological analysis. Mochi is a sculptor trained in the Caccini workshop and almost exclusively known for providing the model of the statue depicting the Gioco del saccomazzone (before 1621) in the well known Boboli Garden of Florence. Mentioned by Baldinucci as “one of the most talented sculptors that our city had in his time“, we can refer to him – at least for the invention – a series of sculptures depicting the Evangelists, (today preserved at the Museo degli Argenti) for the altar and the tabernacle of the Cappella dei Principi in San Lorenzo Church. 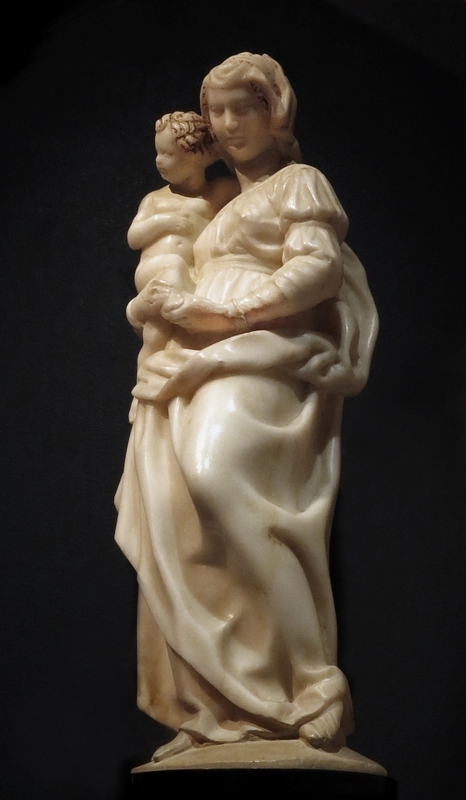 This Virgin with Child enriches so significantly the very small number of works by the sculptor, confirming on one hand his special ability to work on a small scale, and on the other hand his important contribution to the birth of the classical-purist movement that Antonio Novelli will significantly represent in the full 17th century. Orazio Mochi (Montevarchi, 1571 – 1625), attr.